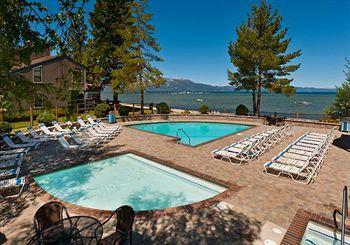 Features: Aston Lakeland Village Resort offers cozy accommodations in South Lake Tahoe. 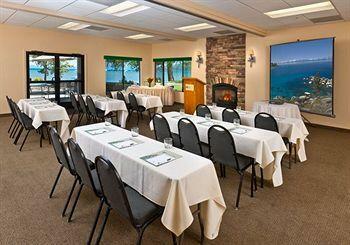 Aston Lakeland Village Hotel has rooms that can accommodate parties ranging anywhere from 1 to 12 people. 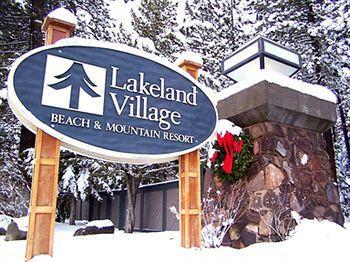 Why We Stay: Aston Lakeland Village Resort offers luxury amenities on-site. 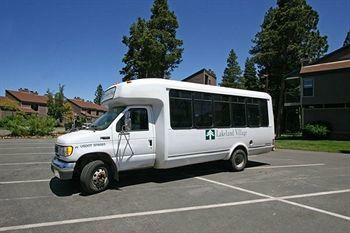 The convenient shuttle service provided by Aston Lakeland Village Hotel makes getting around a breeze. The Amenities: Guests love visiting the private beach where they can avoid the crowds and parking troubles at the public beaches. 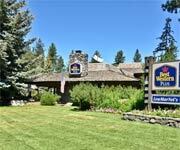 Aston Lakeland Village Resort makes it easy to warm up quickly with its outdoor heated swimming pools, hot tubs and sauna. 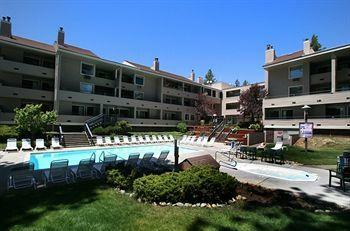 The kids can enjoy the children's wading pool that's perfect for their size! 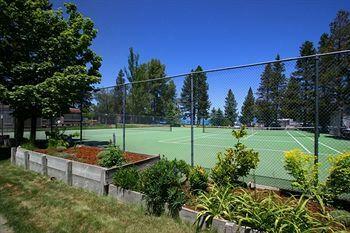 Staying fit is a lot of fun for guests thanks to the on-site fitness facility and tennis court. The Shuttle Service: The complimentary private in-town shuttles allow guests to easily get from place to place in relaxation. Guests love that they don't need a rental car in the winter months. 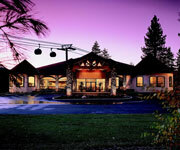 The Free Breakfast: Aston Lakeland Village Resort serves a complimentary deluxe continental breakfast each morning. The spread includes yogurts, pastries, bagels, waffles, cereals, juices and more. 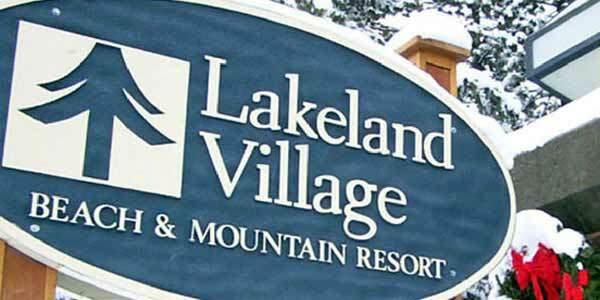 Inside Knowledge: During the summer, guests staying at the Aston Lakeland Village Resort can enjoy a stunning view of the fireworks above the lake. Do Eat Well: During the winter, guests at Aston Lakeland Village Beach and Mountain Hotel will stay well-fed with a generous (and complimentary!) daily breakfast spread. 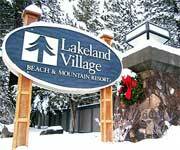 Do Go Shopping: Pick up all your gear for the snowy slopes at Aston Lakeland Village Hotel's on-site ski shop. Don't Worry About Transportation: There's no need to get a rental car when you can take advantage of the complimentary shuttle service. 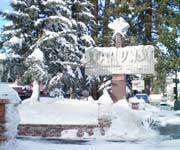 Get to nearby Heavenly Mountain Resort, as well as other Lake Tahoe ski and snowboard resorts, casinos, restaurants, shopping, and attractions. 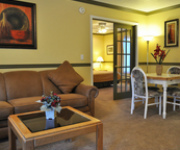 Don't Spend A Fortune: Staying at Aston Lakeland Village Hotel will put you within walking distance of Safeway and CVS. You can pick up plenty of groceries and other necessities at great prices. The Aston Lakeland Village is super nice! It’s right on the water and has its own private beach. 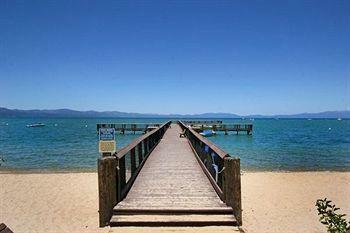 It’s one of the few hotels in all of Lake Tahoe that are directly on the beach. It’s mostly condo style rooms, but they also have full on town homes that are three levels and four bedrooms and those are really nice! I think there are about 30 buildings on the property. Actually, there are so many it’s kind of easy to get lost walking through all the different buildings. 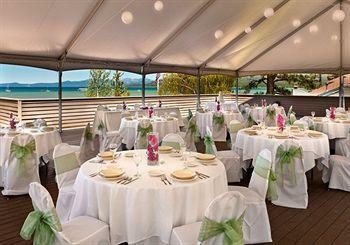 If you can, try to reserve one that overlooks the lake. There’s nothing like waking up to a waterfront view! This is very much a family resort. Some places say they’re family friendly, but this one really is. 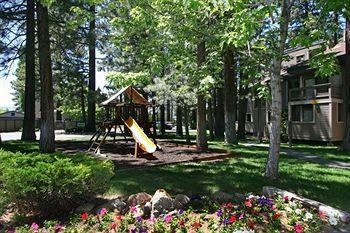 You’ll often see kids running around the property, especially during the summer. 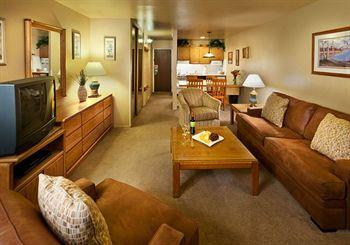 The rooms have nice kitchens, balconies and gas fireplaces. Even though they are condo style rooms, they do have daily housekeeping. 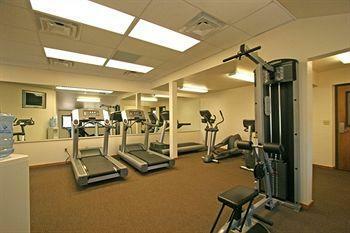 There’s also a pool that’s heated year round and you’ll have access to their hot tub, fitness center and saunas. But one of the nicest features of the hotel is the free shuttles. Although it’s directly on the lake, it sits a little ways from the gondola at Heavenly and the casinos. So they offer free shuttles to anywhere in town up until midnight! Really, there’s no need for a car. Very convenient! This is definitely a place I’d recommend, especially if you’re traveling with a group. 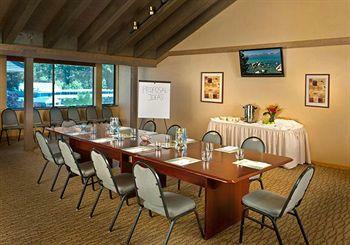 The rooms are perfect to split between a group of friends or a couple families. 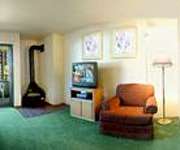 This single room features a plush king sized bed, fully equipped kitchen, gas burning fireplace, and balcony. 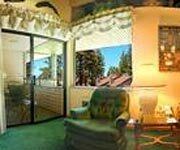 All deluxe King studios are 448 sq. 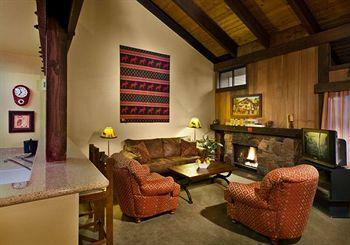 ft., and are located on the 1st or 2nd floor of the Lodge. 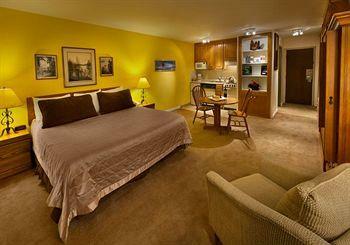 No lake views are offered in this room type, but it's just a short walk to the private sandy beach. 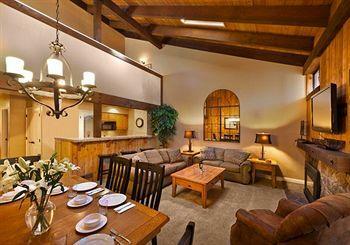 This 2-level lodging is located within quick walking distance to the hotel's private beach. 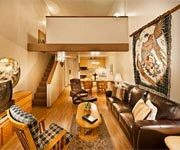 The first level has a fully equipped kitchen, a living room with a queen-size pull-out sleeper sofa, a gas burning fireplace and a balcony. There is a full bathroom on the first level. The second level is the loft sleeping area with a king or queen sized bed and bath (vanity/basin). No lake views are offered in this room type. There is a maximum occupancy of 4 people in this 607 sq. ft. room. This 3-level townhouse comes in at a whopping 1,187 sq. ft. 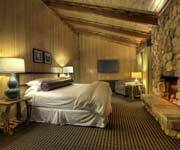 The first level has a master bedroom and bathroom, usually with two doubles, a king, or a queen sized bed. 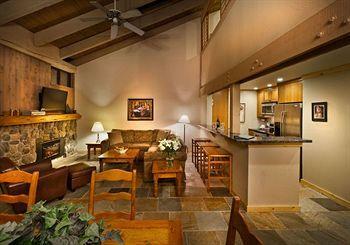 The second level has a fully equipped kitchen and living room with a wood burning fireplace. There is also a balcony on this level. The third level is a loft with sleeping accommodations for 2 people, usually two twins or a set of bunk beds. These units are located in the Pinegrove area. 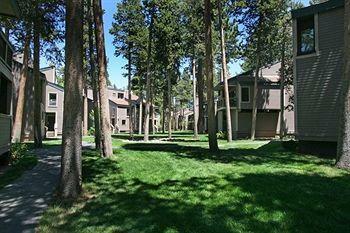 No lake views are offered in this townhome type, but it's only a short walk to the private sandy beach. These rooms have a maximum occupancy of 4 people. This is a 3-level townhouse that comes in at 1,945 sq. ft. The maximum occupancy is 8 people. 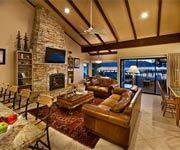 The first level has a fully equipped kitchen, living room with a wood burning fireplace and a large deck off of the living room with a filtered view of the lake. On this level, there's also a master bedroom and bathroom. The second level has two more bedrooms and 1 bath, usually kings, queens or doubles. The third level is up a circular stairwell to a 90% enclosed loft with sleeping accommodations for 2 people, usually two double beds. All of these townhomes have a filtered view of Lake Tahoe - either looking over the summer pool area or between buildings. 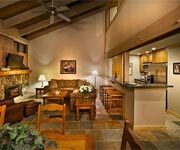 With a maximum occupancy of 12 people, this 3 level townhouse is the most spacious lodging available at 2,311 sq. ft. The first level has a fully equipped kitchen, living room with wood burning fireplace, large deck with direct beach access, and 2 master bedrooms with baths. The second level has three additional bedrooms and 2 baths, usually kings, queens or doubles The third level is up a circular stairwell to a 90% enclosed loft with sleeping accommodations for 2 people, usually two double beds and a bath. All of these townhomes have a filtered view of Lake Tahoe - either looking over the summer pool area or between buildings. This 3-level townhouse is 2,311 sq. ft. and has a maximum occupancy of 10 people. 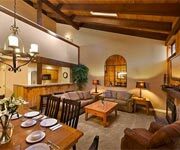 The first level has a fully equipped kitchen, living room with wood burning fireplace and a large deck with direct beach access. There is a master bedroom with full bath on this level. 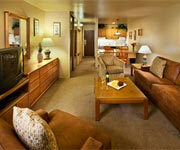 There may also be an additional bedroom and bath. The second level has either two or three bedrooms and one or two full baths. The third level is up a circular stairwell to a 90% enclosed loft with sleeping accommodations for 2 people, usually two double beds. All of these townhomes are directly on the beach. This 3-level townhouse is 2,311 sq. ft. and has a maximum occupancy of 10 people. The first level has a fully equipped kitchen, living room with wood burning fireplace, large deck with direct beach access, and 2 master bedrooms with bath. 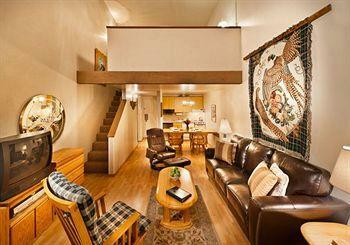 The second level has two additional bedrooms and 1 bath, usually kings, queens or doubles. The third level has the fifth bedroom with sleeping accommodations for 2 people, usually a king, queen or two double beds. All of these townhomes are directly on the beach.